November 13 was an exciting day for Resolute: We were recognized by the American Forest & Paper Association (AF&PA) as a leader in sustainability for our safety performance and by the International Business Awards, known as the Stevie® awards for Women in Business for the achievements of Pascale Lagacé, our vice president, Environment and Climate Change. We also garnered a Stevie award for our corporate blog. It was an honor to participate in the awards ceremony and to accept the AF&PA Leadership in Sustainability Award for Safety for Resolute’s “Working Towards Zero Incidents” objective. Resolute is one of only seven companies to receive an AF&PA Better Practices, Better Planet 2020 award in 2015. “Resolute is making great strides towards their goal of zero injuries in their facilities by not only requiring the use of protective gear, but by developing better-performing and more efficient gear,” said AF&PA President and CEO Donna Harman. 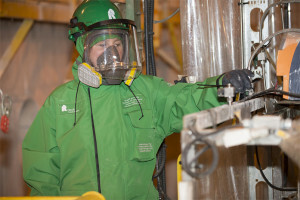 A multi-site task force, led by employees at our Kénogami (Quebec) paper mill, has designed a safer, watertight, breathable chemical protective suit that is appropriate for many mill-related working requirements. The new suit is also a lot more comfortable and durable. 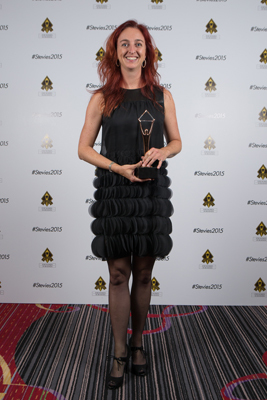 The Stevie awards for Women in Business are the world’s top honors for female entrepreneurs, executives, employees and the organizations they run. The 2015 awards received entries from 31 nations and territories, for a total of more than 1,300 nominations from organizations of all sizes and in virtually every industry. Resolute was recognized in two categories. Pascale Lagacé (at left) was a silver Stevie winner in the “Female Executive of the Year – Business Products (more than 2,500 employees)” category. And our Corporate Communications team took a bronze Stevie for The Resolute Blog in the “Website or Blog of the Year” category. Launched in July 2014 and featuring over 160 posts, our corporate blog covers a wide range of topics, with special emphasis on sustainability and the forest products industry. For more information on the Stevie and AF&PA awards, visit the award-winning Resolute blog, at blog.resolutefp.com.